A classy romantic comedy bordering on farce, Designing Woman delivers both romantic imbroglios and big laughs. 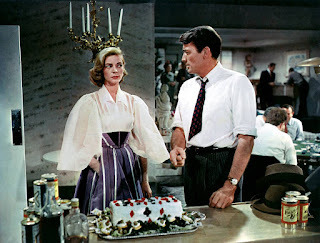 During a trip to California, sports journalist Mike Hagen (Gregory Peck) meets, falls in love, and quickly gets married to fellow New Yorker Marilla Brown (Lauren Bacall). They arrive back in New York City and realize that they really don't know each other. Mike attempts to hide a past relationship with actress Lori Shannon (Dolores Gray), and is also stunned to find out that Marilla is independent, wealthy and runs a fashion design business. Things get worse when they meet each other's friends. Mike's poker buddies include dense former boxer Maxi Stultz (Mickey Shaughnessy), while Marilla's social circle consists of sophisticated members of the arts community, including former boyfriend Zachary Wilde (Tom Helmore). Life becomes even more complicated when Mike's editor Ned Hammerstein (Sam Levene) warns him that mobster Martin J. Daylor (Edward Platt) has unleashed his henchmen to silence Mike's expose of boxing corruption. Written by George Wells and directed by Vincente Minnelli, Designing Woman manages the difficult feat of being smart and preposterous at the same time. 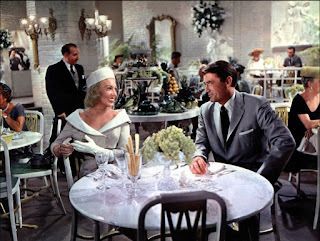 This is a romance with an abundance of madcap comedy, Minnelli surrounding his lovers with enough insanity to keep the energy level at extreme while maintaining narrative control. The film's lush aesthetic adds to the intensity, with bright colours, attentive set design, and lavish costumes providing a vivid and always animated backdrop. Peck and Bacall play to their straight strengths. He is the confident square-jawed investigative sportswriter who always expects to get the girl, and she is the urban independent sophisticate with plenty of fire under the cool exterior. When they are alone together, they click, but otherwise they have little in common other than a willingness to take risks. She joins him at a boxing bout dressed for a night out at the theatre. He accompanies her to a women's fashion show. None of it goes well. With the central characters in good hands, Minnelli is free to surround them with plenty of absurdity. Lori and Zachary provide a double dose of suddenly jilted ex-lovers. Marilla's friends include a hyperactive acrobatic stage performer who cannot help but unleash his gymnast moves. Mike's ex-boxer buddy Maxi is a malfunctioning wrecking machine with hard fists and a harder head. And Lori's large pet poodle has a distinctive personality and an insatiable appetite for chewing on shoes. As the story progresses the supporting cast grows in stature and the film shines with kookiness. The highlights are many. Mike, Lori and a plate of ravioli at an Italian restaurant is a cinematic masterpiece. The convergence of Marilla's artistic friends and Mike's poker buddies on the same night at the same apartment sets up an epic social catastrophe. And Mike's attempt to navigate around town with a fragile gift from his editor Ned is a fine example of on-the-margins comedy. Designing Woman is funny and fearless, an elegant romance overflowing with wacky vitality.